At Viera East Veterinary Center, we pride ourselves with always searching for new ways to care for your dog especially where pain is concerned. Veterinary laser therapy provides a non-invasive, pain-free, surgery-free and drug-free treatment that is used to treat a variety of conditions, and can be performed in conjunction with existing treatments. Laser treatment for dogs employs deep-penetrating light to promote a chain of chemical reactions known as photobiostimulation. This process helps relieve pain through the release of endorphins, and it stimulates injured cells to heal at an accelerated pace. Laser therapy also may be referred to as Cold Laser, Low-Level Laser or Class IV Laser Therapy. Each of these terms refers to the same therapy, using the same equipment to stimulates cell regeneration and increase blood circulation. 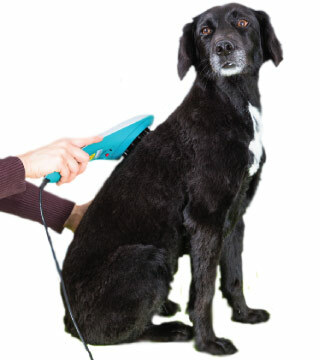 Laser treatment for dogs has no known negative side effects, and is considered both safe and effective across the veterinary industry.